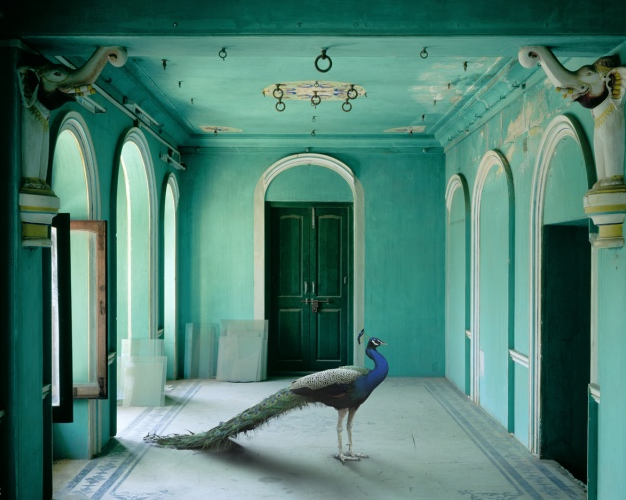 Karen Knorr’s work has always been about power play, whether it be Gentlemen’s Clubs in London in the 1980’s or residents of Belgravia under Thatcher. She has tackled the controversy playfully, revealing with insight and shock, the underlying principles of the privileged which have come to define her oeuvre. The image above is from her most recent series India Song which deals with the cultural heritage of the upper caste culture in Rajput. Knorr layers meaning upon meaning in the connecting of animals and architectural sites. Perhaps a sacred site is inhabited by a creature of mythic fame or a domestic environment houses a contradictory predator. Whatever your interpretation, the result is another beguiling series reacting to hierarchy within caste systems. Knorr has exhibited in Tate Modern and Tate Britain, she has taught at Harvard, Westminster and Goldsmiths and is currently Professor of Photography at University of Creative Arts, Farnham. I don’t have space for all she has achieved here but with her passion for political justice as well as her proven experience in university life she was a prime choice for my questions on the role of the university within the arts. SB: Do you think the university has a greater responsibility in these economic conditions to prepare students for the ‘real’ world? KN: University has always had this responsibility to inform students of the hard facts of capitalist society and what it means to exist as an artist in the market place. There is no safe place and one has to be increasingly flexible and innovative in order to survive in a very competitive market place. An awareness of copyright law and the export duty and VAT are essentials in a globalised economy yet this has to be balanced by critical inquiry and research since these are where true creative innovation occur. Students have to learn how to be entrepreneurial and to invent their own businesses in the now expanded field of photography and the social media. In fact an awareness of the social media and how to use it effectively is imperative. Websites and apps are essentials tools needed to promote and circulate work. If so, how do you think institutions can do this effectively? To keep in touch with changing reality and to offer a haven from the brute forces of the market. To encourage students to think against the grain and to provide access to information and knowledge for a global view of photography. To combine critical inquiry with an awareness of the market yet not to be afraid to question the structures by forming cooperatives that distribute profit and surplus in a fairer fashion. There is an urgent need to develop new alternatives with real ethics that are grounded not just in neo liberal economic models or authoritarian models of capitalism as in China. In short, what is the university’s role? To nurture intellectual inquiry since this with creativity and flexibility is the path to innovation. What advice would you give young practitioners as they begin an artistic career? Keep a sense of peer identity with firm roots in the community. Temper this with an exploration of the world through travel in order to develop a sense of understanding with others in the non western world. Don’t be afraid to take risks and to question the authority of market . Know the rules all the better to challenge them. Do you think artists roles in the future might look different than they have in the recent past as a result of financial times? They have always had to improvise and challenge the consensus. Perhaps now is the best time to do it as there is nothing to lose. Embrace the opportunity to use your right to protest. Now is the time to devise creative solutions to stale ideas circulating in market place. What are your hopes for the future of photographic art? That it will remain experimental with a firm commitment to community.